Just took mine out compoletely and left it out. Air wasnt coming out of the vents as hard as youd think it should have.... 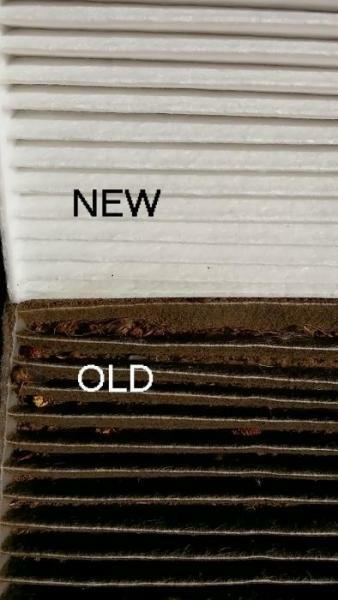 SO i checked the cabin air filter... and i must say.... after 89k miles... it WAS NOT EVER CHANGED. It was PACKED to the brim with stuff.... and fell apart taking it out due to being so old and brittle. I banged it on the ground a couple times... and it left PILES of dirt. Crazy. needless to say... after removing it completely... and im sure ill keep it that way.... it blows at least 2X harder from the vents now. My 2 setting feels like it did when i had it on 4 before. Yeah.. im sure ill get one back in there at some point... when randomly at a parts store for something else lol... just not in any big hurry. Tip: spray the new filter with Fridgi Fresh or Febreeze or some kind of air freshener. lol yeah... i used to spray mine with my cologne.... and it would smell wonderful every time i used the AC or Heat. Damn your engine is going to love the new fresh air bro haha. I got mine at Advance for $15.49. Driveworks DW-35676. It is paper. I didn't know I had a cabin air filter...thought that was only on luxury cars. Check out the pic; 112,000 miles and 7 years of dirt. I've been trying to get the previous owners smoke smell out of my 06 SS/SC got the drive works cabin filter at advanced for 15 bucks. Old one was exactly as I expected black and smelled like a cigarette. I hit it with 2 sprays of chemical guys new car smell, put it in. Then sprayed the new car smell underneath the passenger side and turned the air on with recirculate drove around for awhile and boom car smells amazing.